Than Phuying Poonsuk Phanomyong was born to the Buddhist family of “Na Pomphet” on the 2nd of January 1912 , and was reared in Buddhist Ethics. She studied at St. Joseph ’s Convent School in Bangkok . In 1928 she married Pridi Phanomyong, and together they had six children. Pridi Phonomyong, the Father of Democracy of Thailand was Prime Minister, and Than Phuying Poonsuk always supported her husband. During World War II Thailand was invaded by the Japanese army, and Than Phuying Poonsuk became a member of the “Free Thailand Movement.” She served her country by resisting the invading army side-by-side with Pridi to maintain peace. Due to fluctuations in Thai politics, Pridi Phanomyong was exiled to foreign countries, and Than Phuying Poonsuk and her eldest son, Pal, were arrested by those in power. By observing the teachings of the Buddha that, “Dhamma always protects those who practice Dhamma,” Than Phuying Poonsuk Panomyong never showed any weakness in facing all of the crises of life. 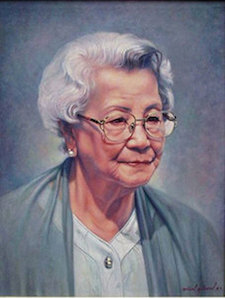 Today at the age of 93, Than Phuying Poonsuk is President of the Pridi Phanomyong Foundation. For the last six decades she has worked to tell the younger generation the history of Thai politics, so that they may continue the goodwill and work of the older generation to preserve independence, freedom, democracy, and prosperity for the country and Thai people.